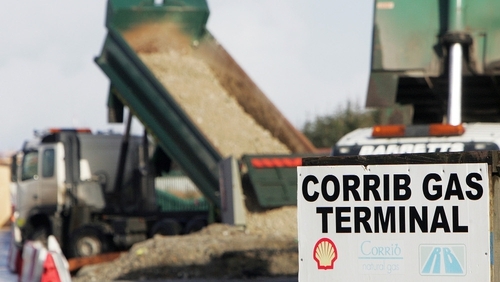 The Minister for Communication, Energy and Natural Resources has given final approval to Shell to operate the Corrib gas pipeline and terminal in Co Mayo. In a statement this evening, Alex White confirmed that he had given consent subject to 20 conditions relating to environmental management, operation, control and monitoring at the terminal. It is expected the first gas could be brought ashore as soon as tomorrow. The decision to grant permission to operate the gas pipeline and terminal comes almost 20 years after gas was first discovered off the west coast of Ireland. Shell applied for Ministerial consent to operate the pipeline and the onshore terminal last August. After the EPA granted a revised industrial emissions licence for the facility in October, the consent from the Department was the final approval needed to bring gas from the Corrib field ashore. Extensive tests have been carried out at the facility in Bellanaboy for a number of months and it is expected that the company will start operations and bring the first gas from the Corrib field ashore in the coming days. A Shell spokesperson said tonight he was hopeful the ambition to process gas in 2015 would be achieved. Today's decision is the latest chapter in a long running saga of confrontation, protest and division that has surrounded the development in Co Mayo and further afield. Initially, gas was initially expected to flow from Corrib by 2004 and it is estimated the development has already cost in the region of €3 billion. Many locals have had long standing concerns about the impact the pipeline and associated developments will have on the landscape, both during the development and operational phases. Shell has committed to implementing an extensive biodiversity plan for the area and the company says standards have been thoroughly verified during all stages of the project. After initial pipeline routes were rejected, an application to construct a tunnel under Sruwaddacon Bay was approved in 2011. That was completed in 2014 and marked the completion of a pipeline stretching from the terminal in Bellanaboy to the gas field, some 85 kilometres offshore. Shell says that when the pipeline is operating at full capacity it would provide more than half of the country's gas requirements. However opponents of the development have raised questions as to how long that level of supply will be for in the overall lifespan of the Corrib field. The country currently imports over 90% of its natural gas requirements from the UK. More than 6,000 people have worked on the development of the Corrib field.